After my brothers poo-pooed my mac and cheese last year, I tried another version this year for the holidays. This time I only used pre-shredded Cheddar, Monterey Jack, and Parmesan — nixing the fancy schmancy Gruyère and smoked mozzerella that are so near and dear to my heart. And the Parmesan? I used the real stuff. The nutty, fragrant, pungent stuff. A great big wedge of it. To fake out my family, I covertly grated it and surreptitiously snuck it into an empty green Kraft shaker bottle. Ha! Take that picky eaters! My brothers also have an aversion to bread crumbs (?!) which led me to make a quick substitution: crushed-up potato chips. The result? Super easy. Super creamy. A little bland, but the dish was scraped clean. 1. Preheat the oven to 350°F. Butter a 3- to 4-quart gratin dish or another shallow baking dish. 2. In a kettle of salted boiling water, cook macaroni until just al dente. Drain well. 3. In a heavy saucepan, melt just 6 tablespoons butter over moderately low heat. Add the flour and cook the roux, stirring with a wooden spoon, for about 3 minutes. Add the milk, stock, or cream, a little bit at a time. Don’t stop stirring. Slowly add more liquid until you have roughly 4 to 4 1/2 cups of sauce. Bring the sauce to a boil. Reduce the heat and simmer, stirring the sauce regularly, until it has thickened. Add salt and pepper to taste. 4. 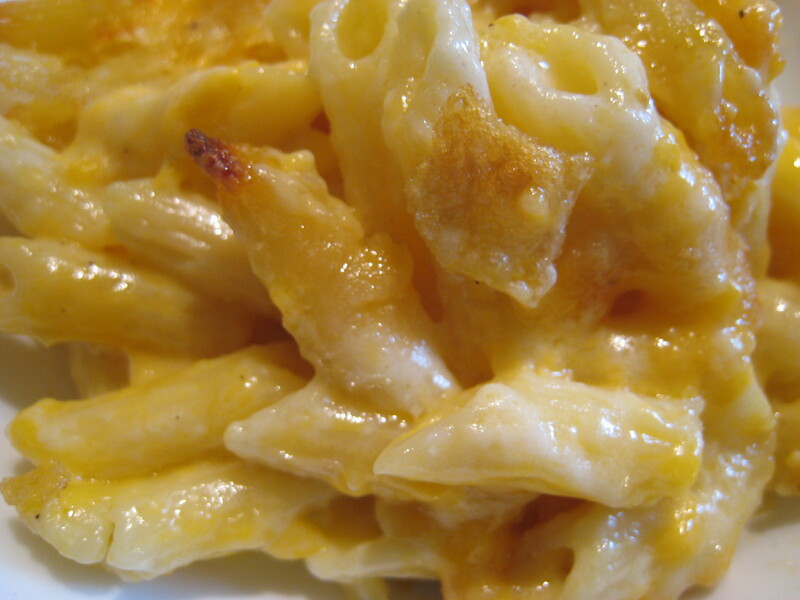 In a large bowl, combine the macaroni, the sauce, the shredded cheeses, and Parmesan. Transfer the macaroni mixture to the prepared dish and spread it out evenly. 5. Sprinkle crushed chips over the top of the macaroni and cheese. 6. Bake the macaroni in the middle of oven for 25 to 30 minutes, or until golden and bubbling. Let rest for about 10 minutes before serving. I think I prefer the breadcrumbs too.